Cross between Brussels sprouts and kale. 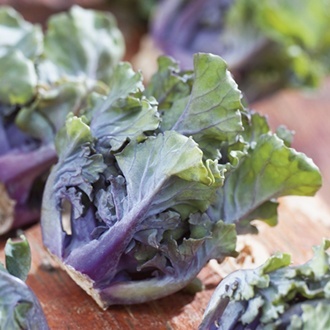 This British-bred cross between Brussels sprout and kale produces unusual, open frilly buttons which are much more than just a novelty. The flavour is more akin to spring greens than to either parent while the plants are extremely winter-hardy. We feel you will be impressed by this new and delicious vegetable. Previously known as Flower Sprout. Sow indoors February-March in pots or trays of compost, 1.5cm/half-inch deep. Transplant when large enough to handle to further pots or trays, spacing 5cm/2in apart. Harden off in May, spacing of 60cm/24in apart. Sow outdoors in April in a seedbed, 1.5cm/half-inch deep. Transplant in May, 60cm/24in apart and water in well. Harvest October-March.